On the 1st (Mon), wander the streets of Jalan Alor, then take in panoramic vistas at Menara Kuala Lumpur, then stroll through KLCC Park, and finally explore the world behind art at Islamic Arts Museum Malaysia. 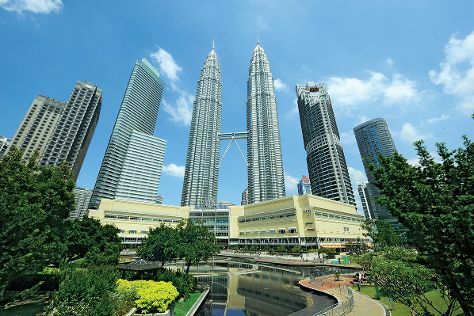 Get ready for a full day of sightseeing on the 2nd (Tue): look for all kinds of wild species at KL Bird Park, then Head underground at Batu Caves, and then admire the striking features of Petronas Twin Towers. Plan a Kuala Lumpur trip in moments using our itinerary builder. Alexandria, Egypt to Kuala Lumpur is an approximately 13.5-hour combination of taxi and flight. You can also do a combination of bus and flight. The time zone changes from Eastern European Time to Malaysia Time, which is usually a 6 hour difference. Prepare for a bit warmer weather when traveling from Alexandria in October: high temperatures in Kuala Lumpur hover around 38°C and lows are around 28°C. Wrap up your sightseeing on the 2nd (Tue) early enough to travel back home.